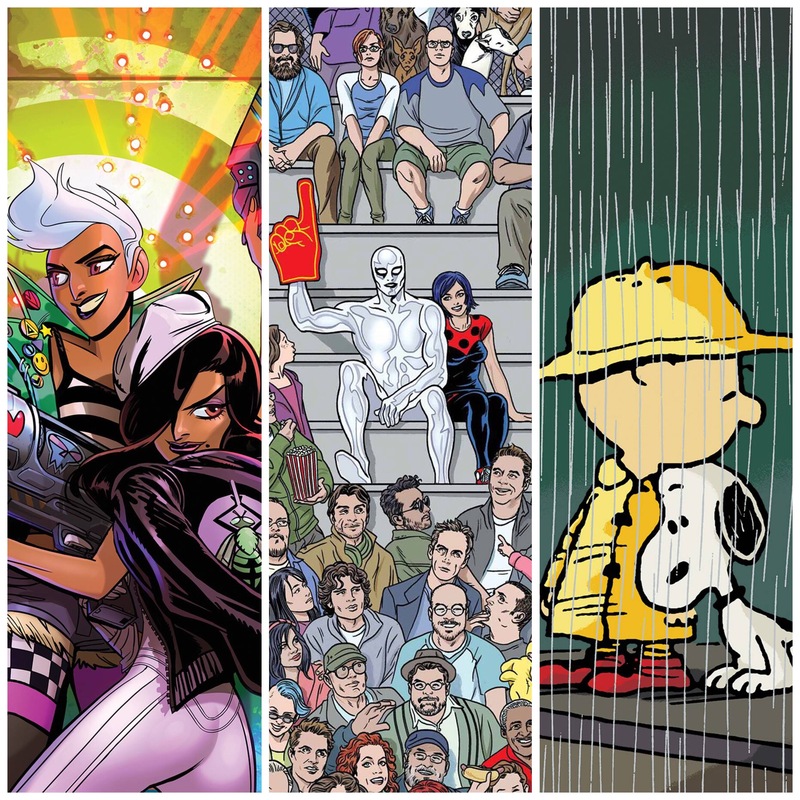 Home » COMIC BOOKS » Stranger Reads – Comics Log 2016.7.10, The New and Old Friends Among Us..
Stranger Reads – Comics Log 2016.7.10, The New and Old Friends Among Us..
Fresh from the recent Wednesday new comics shelves, are the hot new singles some us nerds get exciting about. I have some latest reads below, with a mix of old and new..
An interesting new series for those who enjoy their Serenity and Guardians of the Galaxy with a lot of old cyberpunk mixed in. Bounty revolves around the work of two intergalactic bounty hunters. It’s action packed and definitely fun for the first issue. However, there is a lot of extra lingo and characters thrown that disjoint the pacing of the first issue. I would love a glossary or appendix to help sort out this, but perhaps learning along the way is part of the fun. Yet, a solid first issue but needs to slow down in future issues so we can get to know the characters. I love Michael Allred’s art and Dan Slott’s writing (sometimes). But for the Silver Surfer, I remain a bit reluctant for this combination, and the continued inclusion of his hipsterish companion, Dawn Greenwood. I wish the Surfer would return to his space-faring travels alone as he quotes angst verses of poetic torment and loneliness. What’s funny here is a very meta moment, where a boy questions the dimensioned presence of the Fantastic Four and the Surfer, which has happened for reasons beyond the cosmic awareness of our Silver hero. Overall, a great cheeky issue as the Surfer adapts to Earth life, while taking time for some old school fighting action on the Moon. I enjoyed that balance. Still back to the future as our Paper Girls are stuck in the strange world of 2016. There are deeper mysteries, sorting through the real world familiarities and fantastical. I suppose both are hard to pick apart to any child of the 1980s. While amusing as such is, I think the pacing is a bit lost, as we readers can feel empathetic to the plight of our time travelers. What in the world is going on I would ask, with strange technology and giant monsters. Some new revelations keep things interesting toward the end, loving the fact that things will not be okay. That all is quite rad, with the story continuing to entertain. A great origin story told in great detail setting up the character before the premise begins. Much revolves around the idea of the Golem, with its roots in Jewish folklore and history. But the bigger story is a small neighborhood in Yonkers, New York as locals deal with crooked bullies sent by a crooked real estate developer, leading to an important development sure to excite. Everything here has the worthwhile (though not fully original) ingredients for a great super hero tale, with much potential to reach long-term epic proportions. The artwork I love, stylish and mood-setting for things to come. I look forward to more Brik. The series is growing on me, and this issue is heavy reason on why. I love the crazy concept and alien designs brought forth. 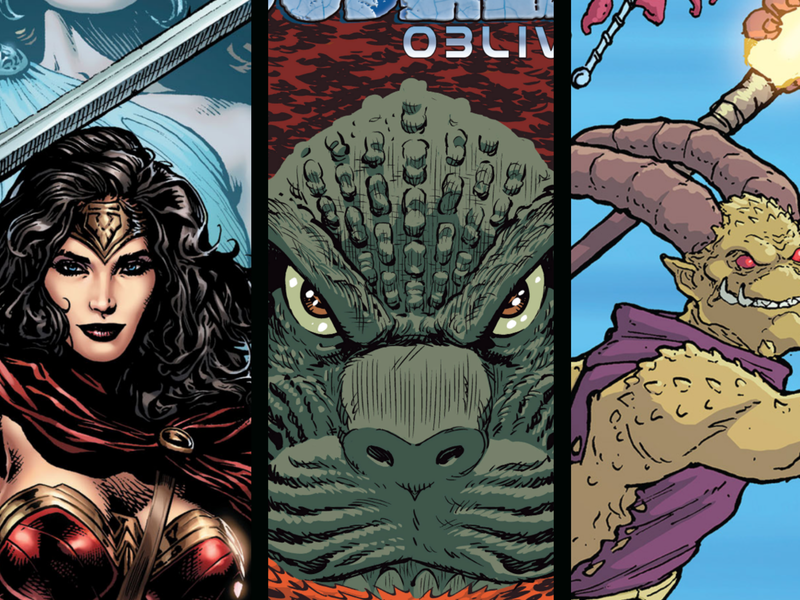 Much of this issue involves our crew at a bar filled with dangerous looking alien types, much like that in Star Wars. but the conversational tone over differences and happenings makes the universe of Faster Than Light engaging and worthwhile of a read. But it’s still imperative to use the matching UAR app to activate it’s augmented reality features, which contains text that goes far deeper into the universe building Brian Haberlin does so well. My only major criticism is the lack of strong characterization by crew members. I would love a bit more time taken out to build upon the individual crew members, to get to know them better through stories. I’m hoping while on board, we see more of this soon. This is the very last of the Boom! Entertainment licensed works based on the comic strips of Charles Schulz. The series as a whole has been a fantastic and faithful representation of the original strips. There are a couple heartwarming tales that go beyond the wit and humor of the classics. A story that grows Peppermint Patty’s character as she fights a school dress, code. Snoopy learns the Daisy Hill Puppy Farm is set to close. Both stories and others focus on wonderful bonds and relationships, that I think is the very heart and soul of Charles Schulz’s work. We also have some very funny moments, leading to an end of which feels like a sad goodbye to n excellent and very underrated licensed run.